Explore New Zealand's North Island with its unique 7 unique geographical regions and diverse natural beauty, from soaring mountain peaks, fiords, lakes, rivers, native rugged bush, the majestic volcanoes of the North Island's central plateau to the central North Island skifields of Whakapapa and Turoa by bus and coach from Kerikeri. Kerikeri (Pop 4878) is the largest town in the Bay of Islands on the North Island of New Zealand, is a popular tourist destination about three hours drive north of Auckland, and 80 km north of Whangarei. It is often described as the 'Cradle Of The Nation', being the site of the first permanent mission station in the country and it has some of the most historic buildings in New Zealand. 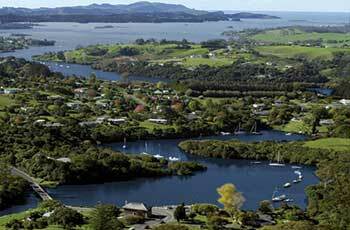 A rapidly expanding centre of sub-tropical and allied horticulture, Kerikeri lies at the western extremity of the Kerikeri Inlet, a north western arm of the Bay of Islands, where fresh water of the Kerikeri River enters the salty Pacific Ocean. Kerikeri has a long, colourful history. The region’s oldest historic site is Koropiro Pa, but Kerikeri is also home to two precious colonial buildings. Kemp House (the Kerikeri Mission Station), New Zealand’s oldest standing European building, was built in 1821 to house the Reverend John Butler. It contains a fascinating collection of furniture and household items owned by the succession of missionary families who lived there. Right next door is the oldest stone building in New Zealand, the Stone Store, originally constructed to hold mission supplies but used mainly as a Kauri gum trading post. It still operates as a retail store, though now it sells ‘Kiwiana’ products. A trip to nearby Rewa’s Village will reveal a mock-up of a pre-European Maori village. Kerikeri has a thriving retail economy with two large supermarkets and many small retailers and a range of cafes and restaurants offering foods from around the world. Travelling from Kerikeri is in modern buses and coaches with InterCity Coachlines operating a fleet of eco-friendly air conditioned buses with reclining seats and foot rests. Great Sights and Newmans Coachlines operate premier services using a fleet of modern eco-friendly air conditioned coaches featuring reclining seats with foot and head rests and onboard toilet/washroom facilities. InterCity Coachlines Starlighter overnight bus services operate from Wellington to Palmerston North, Taupo, Rotorua, Hamilton and Auckland connecting a Wellington with the Cook Strait ferry services operating between Picton in the South Island to Wellington in the North Island. The Starlighter overnight services features reclining seats with foot and head rests, individual reading lights and air conditioning controls, onboard toilet/washroom facility and makes two refreshment/comfort stops on route. If you want to explore and see New Zealand's unique scenic beauty from Kerikeri, there are a range of flexible 'Book As You Go' bus, scenic coach, ferry travel and sightseeing passes giving you value for money travel.